There is less to blog about. I spend my days watching world cup (looking forward to a Spain/Netherlands final–I’m for Spain), chatting with friends online, “working”, reading for class, and attempting to figure out life. If I can’t remember something interesting I have learned, then it really must not be very interesting. Plus, it seems like most of the stuff I learn is like about Justin Beiber’s tattoo and stupid stuff like that. Come to think of it the three main things consuming my time (besides school and work), are watching Pawn Stars, the World Cup, and thinking about travel/the future. In particular, I have been thinking of proposing to a conference being held in Belfast, Ireland (www.journeytowardshealing.org). Proposals are kind of due this Friday… Then I was looking at an AAR (http://www.aarweb.org/About_AAR/Regions/New_England-Maritimes/default.asp) conference as well. Conferences are not for procrastinators. You have to know they are happening up to a year in advance, and you have to propose/register 6-10 months in advance. Am I really made for this? This academy thing? I do not know. But I do believe I am made to go to Belfast, Ireland. All that being said, I am currently taking a class in Liberation Theology with Jim Nickoloff and Gustavo Gutierrez (kind of a big deal), and I knew it would screw me up again. A year without theology, and now two days in–my head is spinning. Mostly because of my save-the-world complex. I am going back to seriously considering volunteer/jobs in Latin America post-grad to become fluent in Spanish (Peace Corps, State Department, whatever I can find/afford). Geez. I love people too much sometimes. This lovely morning I have continued to feel stressed out after the ending of finals, and this evening I begin summer courses (woohoo). Stressed why? I dunno, something about trying to figure out the rest of life and meeting with important people, working, and possibly applying for a second job. eek. Again, blogging is probably the last thing I should be doing right now, but I thought I would share a couple things… Besides, while I am staring at my paper on trauma on the left side of my screen, I can write a bit about this book that BLEW MY MIND! 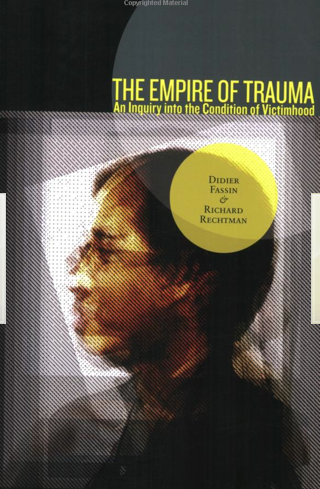 The Empire of Trauma is like a historical critical athropological sociology book on how Western understanding of trauma has come about. Basically it persuades you to see trauma as something that wouldn’t exist without the claim of the victim. You can’t have trauma without being a victim. Until a person (veterans, women, and children) could “prove” some negative effect, or receive some understanding and empathy from someone who witnessed or experienced the same thing, that person’s “trauma” was illegitimate. The history or trauma is about legitimizing the claims of the tormented, violated, and marginalized. Anyway, it blew my mind because it gave me a new lens to understand trauma. I just thought trauma was trauma, bad stuff happens, and its bad, and we all agree on it. But really trauma has always been in the eye of the beholder. Not to minimize it, but trauma is an experience, like any experience, that we have to somehow deal with or make meaning of (even if that is saying it is meaningless). The authors argue that psychologists kind of killed the survivor mentality of trauma, and created an empire of retributive justice seeking crazy people where pretty much ANYTHING can be trauma–and I want to be recognized and compensated for my trauma, cause, do you know what I went through? Consequently, we have a lot of people walking around trying to prove who has the worst life. Welcome to The Empire of Trauma. Point is: pain and suffering are real, but our lives do not have to end there, and for most of the world–it doesn’t. Go read or quickly skim the book–it will BLOW YOUR MIND! I am still not sure if I agree with everything, but it gave me another view of how societies interpret trauma and how that can carry over to the person… which I never really thought about. but i had to write this down.